Scotland has a set of surprise heroes - in the form of road gritters. Thanks to social media, Transport Scotland's fleet of light-flashing, salt-spraying kings of the road have become a bit of a sensation. Followers have been glued to their screens following the roads authority's Gritter Tracker. They were surprised to find out the vehicles had humorous names like Sir Andy Flurry, Sir Salter Scott and Gritty Gritty Bang Bang. The force was with the people of Ayrshire during Tuesday's snow flurries, their roads were being protected by Luke Snowalker. 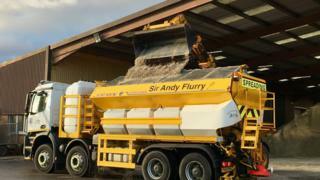 Around Dunblane, Sir Andy Flurry was out on duty. Along with strong snow-slaying names like the Ice Destroyer, Snow Queen and Ice Buster, more unassuming gritters like Fred, Jack and Frosty have also been out and about keeping the country moving. Not forgetting Sprinkles, Sparkle and Ready Spready Go. The Gritter tracker has a serious purpose, to reassure and update Scotland's drivers on the number of vehicles sent out to treat the roads during winter conditions. The winter fleet for trunk roads has a total of 208 vehicles available for spreading salt and ploughing. Names were introduced by the individual companies operating parts of the fleet. Bear Scotland staged competitions for primary schools to name their local gritters. The scheme let pupils identify with the work undertaken to keep their roads clear and moving safely. A spokesman for Bear Scotland said: "We've got nearly 100 winter vehicles involved in our winter service throughout trunk roads in the north east and north west of Scotland. "Out of these, we have 45 large 32-tonne eight wheeler spreaders, which are some of the largest in the UK. "A few winters ago we got involved with a competition led by Transport Scotland to help name some of our 32-tonne gritters, and reached out to local primary schools in our areas to help us come up with some names for the vehicles. We had a great response from the schools that were involved with the competition, with some excellent entries submitted. "Our teams that visited the schools all commented on how the pupils were taking on board the information about how our winter operatives help keep the trunk roads clear of ice and snow each year. "We now have the likes of Sprinkles, Mrs McGritter, Sir Grits-a-lot and Gritty Gritty Bang Bang out working on trunk roads across the north of Scotland."